Beaches, marshlands, wooded bluffs comprise this peninsula at headwaters of the Bay. 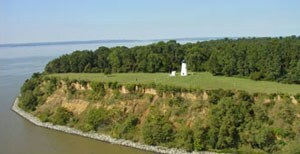 Turkey Point Lighthouse provides views of Chesapeake Bay, and Northeast and Elk rivers. Launching ramps, tent and cabin camping.